Bring a medium pot of water to a boil. Place ginger in the pot and simmer for 10 minutes. Discard the water (or reserve it for a hot toddy) and rinse ginger under cool water. Place two cups of water and two cups of sugar in a medium saucepan. Bring to a boil to dissolve the sugar. 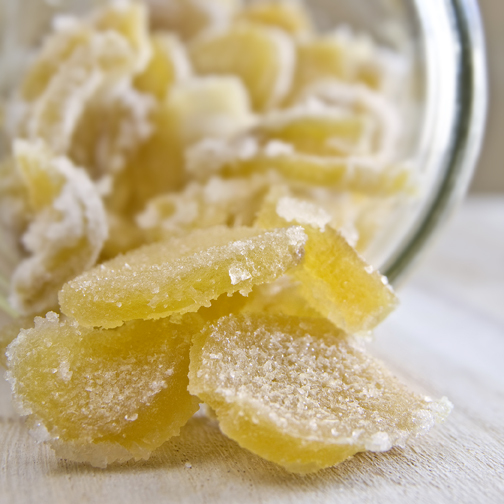 Add ginger to the sugar water and simmer on low heat for 1-1 ½ hours. Remove from heat and strain. Carefully move the ginger to a rack and sprinkle with sugar. Let them dry for 8-10 hours in a cool dry place, turning them halfway through. 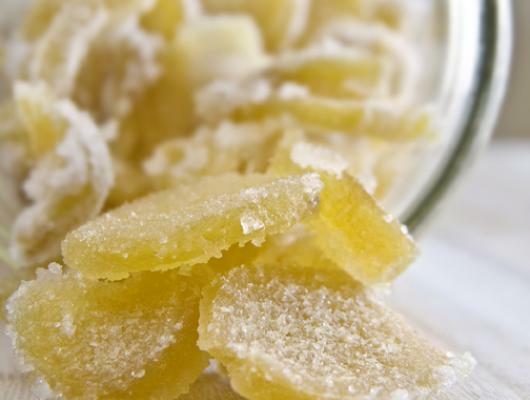 Sweet and spicy candied ginger. Great for a Christmas gift or a remedy to keep colds at bay.